The “Internet of Things” is a buzzworthy concept that can’t be avoided at this point, but what it means to connect the offline and online can’t be full appreciated until you attempt to do it yourself. For some background, the IoT basically refers to processors, sensors, and some sort of connection to the Internet, which are embedded into our environment through common place objects. 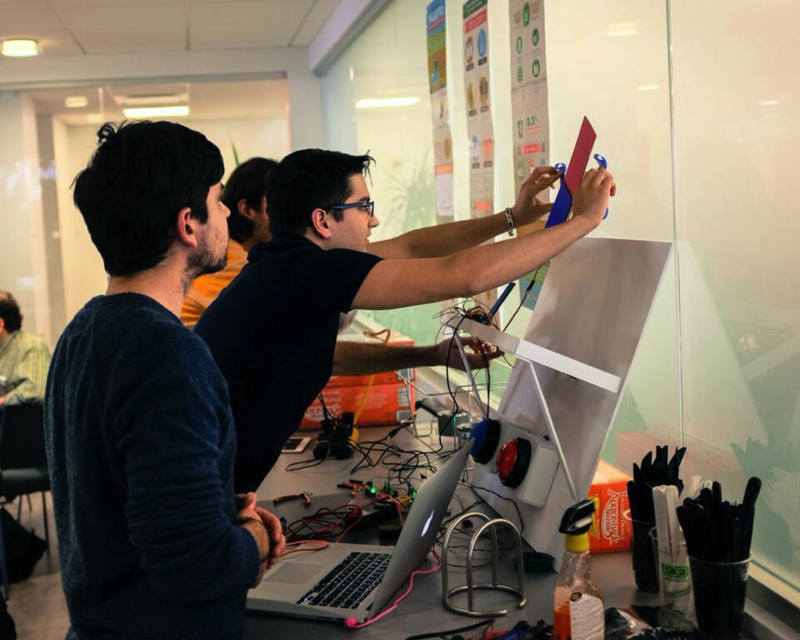 The goal of our Isobar NYC Hackathon this February was to explore the underlying aspect of IoT: connectivity. This led to its title, “Connect For ________,” where one might fill in the blank with anything and everything they want in the way of connected intelligence embedded into the inanimate world around them. From an experimental learning perspective, there are three aspects of connectivity we focused on: conceptual thinking, hardware, and software. On the hardware side, the main idea was to explore how we connect otherwise “dumb” devices to the Internet or other devices (via. Bluetooth, WiFi, or NFC). We answered the question: what electronics or devices are needed to make this happen for a prototype? In addition, software was developed in order to provide a user interface and to tie everything together on the backend. But perhaps most importantly, the hackathons gave everyone the chance to dig deeper into purpose and context of IoT. What problem(s) are we trying to solve by establishing new or reimagined connections? Can new connections help us better understand our environment, other people, or data better? What are we connecting for? We formed three teams that approached this theme in vastly different ways. Team This or That created an interactive polling booth that provides real-time feedback and results to pollsters through a variety of physical graphs and charts. What really is the best part of the Oreo – the cookies or the cream? Is the dress black/gold or blue/white? This or That was the only team with moving hardware components as part of their solution, which they found came with its own set of difficulties. Short circuits aside, they created a great prototype that pushed the limits of real-world data visualization. In the final minutes leading up to the judging, they managed to get their servo-driven display to function correctly – much to everyone’s delight – as we watched the robot-like graphical display dazzle the audience. 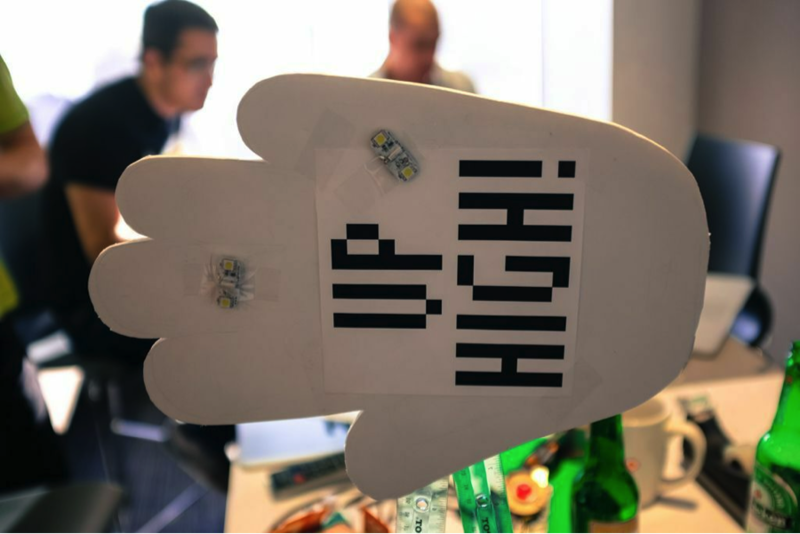 Team Up High created a tool to allow opposite sides of the office to communicate a simple signal of greeting or encouragement through a high five tool. 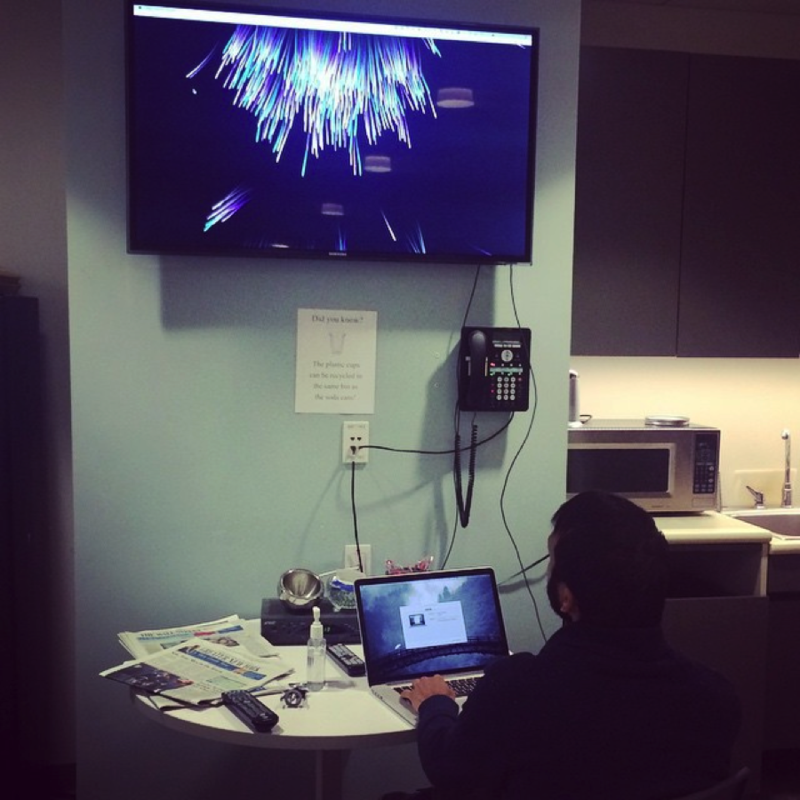 Each side of the office receives its own high five machine, which when slapped alerts the other side of the office through bright lights that there is high five ‘hanging’ and waiting to be returned. Team IsoBIRDS created a prototype based around motion sensors and microphones that measure the office environment and impact a flock of birds viewed on a connected screen. The IsoBIRDs react to loud sounds that make them fly faster, and more birds appear when more people are detected in the office. Also, a prototype of an app allowed people to answer interesting questions about themselves and ‘send out’ the birds with that information, so that anybody who ‘captures’ a bird with that app could learn more about his/her coworkers. 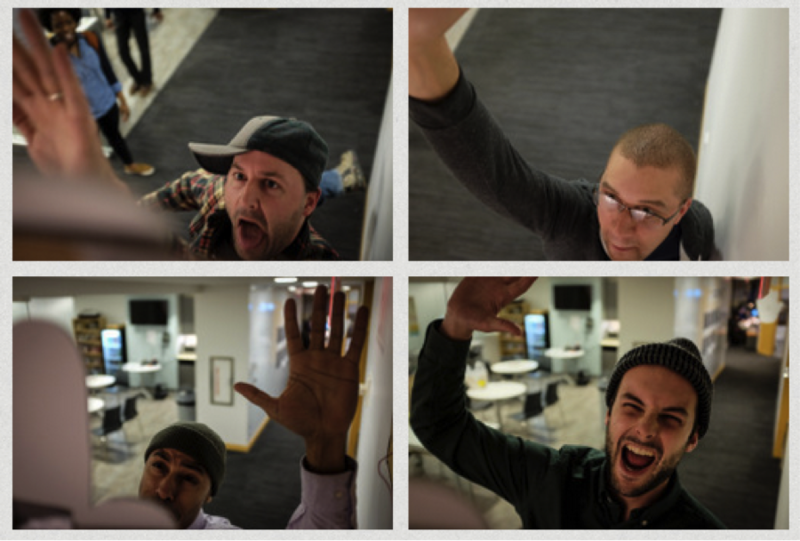 Overall, the hackathon was a great success. Not only were three interesting prototypes developed, but our teams learned new skills and are all amped on the idea of doing future hackathons. Creating an atmosphere of learning and experimentation at Isobar is critical to true innovation, and I’m psyched that this early foray was so successful. Now on to the next one!